>Built-on Shims: add "-#S" where # is the desired shim height of 1-5 inches. Example: -4S = 4 inch built-on shim. 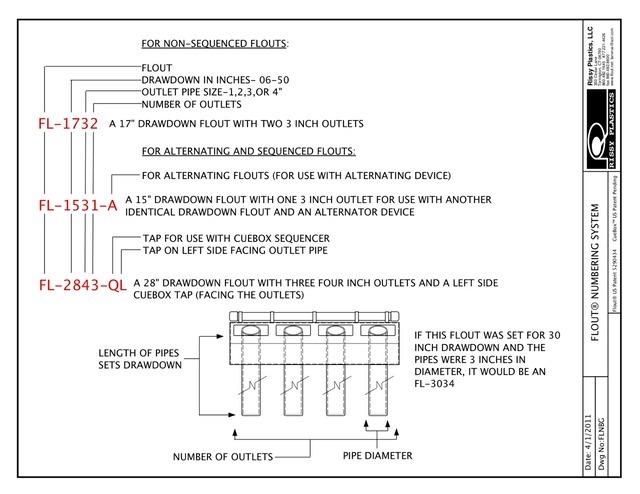 The "SET": The Cuebox order number is QB followed by the number of trigger manifolds, followed by the "SET" which is the Flout turn-on depth in inches. The SET is drawdown (DD)+ shut-off depth of the Flouts (4" for 3" pipe Flouts and 5" for 4" pipe Flouts)+ any shim height, measured to the center of the H fitting. The standard set for a Cuebox is 15". For deeper sets, an extension shim or table will be supplied. For a set of less, units are trimmed up to 5" for a minimum set of 10" for a 6"DD 3" pipe Flout arrangement. See Basic Requirements for minimum Flout drawdowns. The overall height of a Cuebox body is the set plus 8 inches. Add another 6 inches for tee handle clearance. Example: Three 3" Flouts with 24 inches of drawdown (DD) on 4" shims are required. The SET would be the shut off depth of 4 inches + 24" DD + 4" shim for 32" total. A 15" standard SET Cuebox and an 17" extension table would be supplied. The number would be QB-3-32. Example: Five 4" Flouts with 17 inches of drawdown (DD) without shims are required. The SET would be the shut off depth of 5 inches + 17" DD for a 22 inche total. A 15" standard SET Cuebox and a 7" extension table would be supplied. The number would be QB-5-22. Example: Four 3" Flouts with 8 inches (DD) without shims are required. The SET would be the shut off depth of 4 inches + 8" DD for a 12 inch total. A 15" standard SET Cuebox would be trimmed 3". The number would be QB-4-12. Example: If number is QB-2-21 ...It's a Cuebox with two outputs with a 21 inch SET. Example: If number is QB-6-14... It's a Cuebox with 6 outputs with a 14 inch SET.